As your pallet shipper in Brisbane, we are committed to transporting your temperature-sensitive goods successfully. Having a reliable pallet shipper that keeps your materials in good condition is a necessity if you need to supply temperature-sensitive products to stores across Brisbane, Queensland. You also know how frustrating it is to deal with a pallet shipment that has become damaged during the transport process. Here at The Wilpak Group, we provide a variety of industries with solutions for successfully transporting temperature-regulated products. If you regularly work with a pallet shipper, having the confidence your shipment will arrive at the correction destination with minimal damage allows you to achieve greater risk management overall because of reduced waste. It also allows you to reliably save money while providing your customers with the products they want and need. If you have yet to find a pallet shipper that helps you accomplish these goals, you can trust your shipment needs to us. Our insulated pallet covers feature our renowned Insul® technology, and above all, we offer the worry-free solutions you are looking for. We have transported a variety of products for a number of industries since 2003, and with our insulated pallet shippers, you will achieve your goal of continuously successful freight shipments. Complement this with exceptional customer service, and you will never want to go anywhere else. At The Wilpak Group, our experienced team would be more than happy to answer your questions about our products and services. Give us a call today and find out more about why are the only pallet shipper you will ever want to work with moving forward. We provide companies in Brisbane with insulated pallet covers that are designed with reliable shipments in mind. 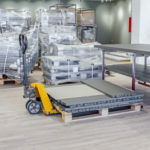 If you often find that your pallet covers are an issue when it comes to shipping your products safely and securely, you may be looking for alternatives that help you reduce waste during transit and improve your bottom line.